Looking west toward U.S. mainland from the beach, North Bimini. The island of Bimini is 53 miles east of Miami, Florida. It’s a wonderful island, about 7 miles long and 700 feet wide. It’s different than many other islands. There is no Senior Frog’s on Bimini. No timeshares. No Club-Med. No one is selling t-shirts on the beach. There is a gambling casino on Bimini now, so I suppose cultural ‘improvements’ are soon to follow, but I hope not. About 2000 Biminites live on the islands of North and South Bimini, with the airport being on South Bimini. The tiny communities of Alice Town and Bailey Town are located on North Bimini. If you arrive by air, as we did, you’ll need to take the ferry across the channel that separates the two islands to get into town. 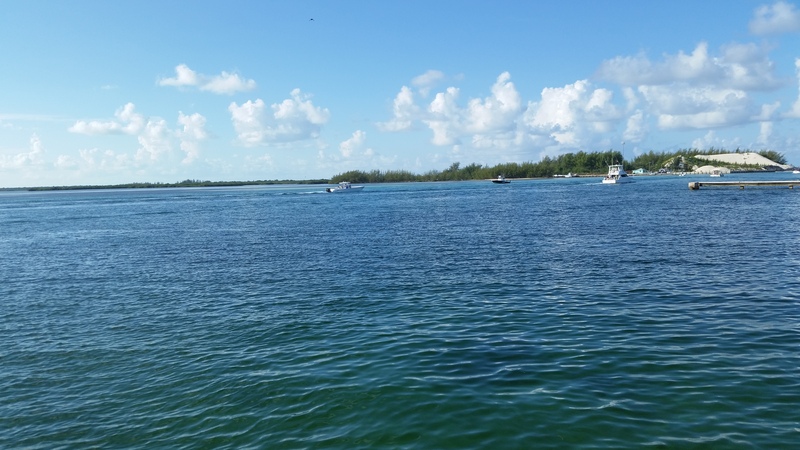 The photo below was taken crossing from South Bimini to North Bimini. On the ferry crossing the channel between North & South Bimini. Ponce de Leon went to Bimini in the 1500’s to look for the Fountain of Youth. 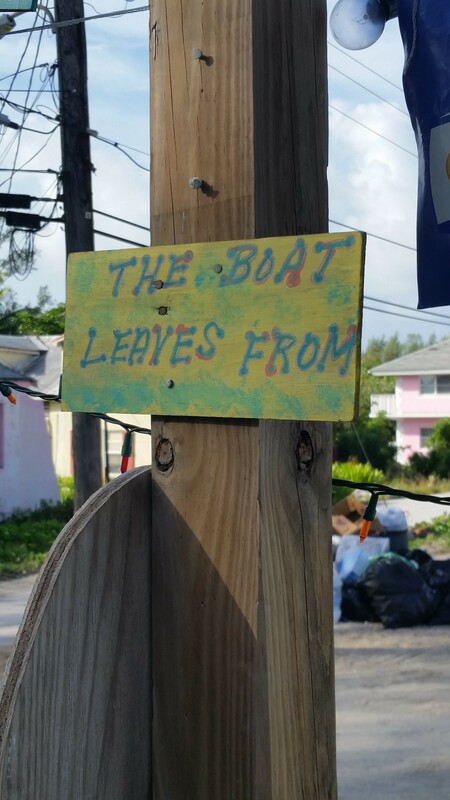 Jimmy Buffett went to Bimini to write a song. 1988 presidential hopeful Gary Hart went to Bimini to hide an extra-marital affair. Rev. Martin Luther King Jr. went to Bimini to write a speech. Al Capone went to Bimini to negotiate with liquor dealers. Lucille Ball went to Bimini to escape Hollywood. Hemingway went to Bimini to write a book. Countless seekers have travelled to Bimini to search for the Lost Continent of Atlantis. 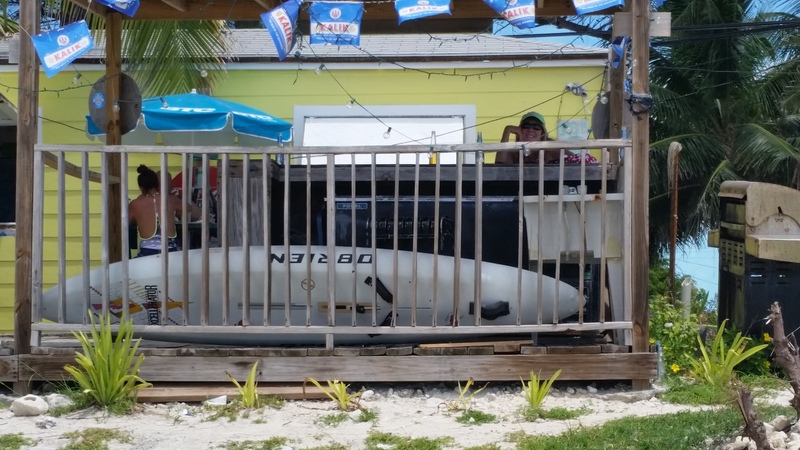 Last month we went to Bimini, for no other reason than to see what’s there and to soak up some sun and maybe a little literary lore left over from the burned out ruin of the Compleat Angler, Hemingway’s old haunt. Our 17 minute flight from Ft. Lauderdale to Bimini International was delayed for 4 hours. Such delays are more the norm than the exception. You take delays in stride when you go to Bimini. Leave your watch at home. Never go to Bimini when you are in a hurry. You can’t make things happen there. Don’t go to Bimini if you want to rent jet skis. You cannot parasail. Fishing and diving are very much allowed. Don’t go to Bimini if you want nightlife, or craft beers. If you want to boat, BYOB. Gas sometimes runs short in Bimini. If you drink alcohol, drink Kalik beer and nothing else. Customs is a breeze on Bimini. We were through in about 15 minutes. There was one agent stamping passports when we rolled up to the BIM International Terminal on the daily flight from Ft. Lauderdale with about 25 other passengers, and before we knew it we were all packed into a van, and jostling down the road to the ferry terminal. 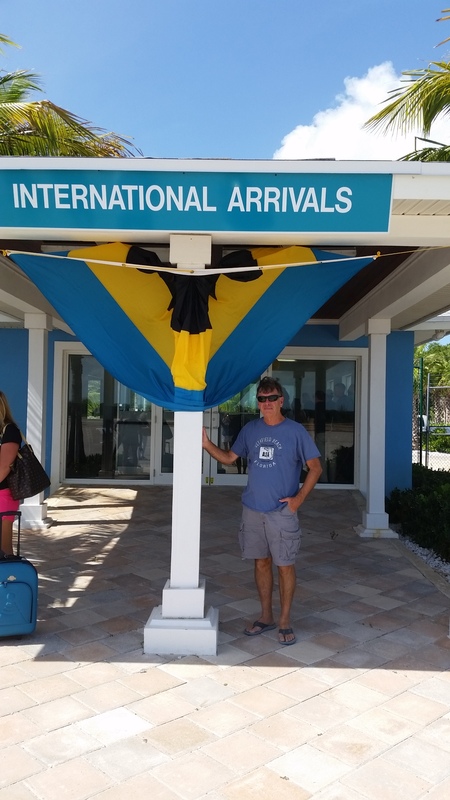 Me at the International Arrivals terminal, BIM. It’s a pleasant ride across the channel to North Bimini. Budget about 4 bucks per person for the ride. For 2 dollars more the ferry man will take you on past the ferry terminal to the dock at the Sea Crest hotel which is where we stayed. I reviewed the Sea Crest on Trip Advisor. My review is here. We arrived late afternoon and the party was on. Reggae music from the park opposite the hotel pounded long into the night. It was the first Monday in August, which is Emancipation Day in the Bahamas. This is the day that commemorates the emancipation of the slaves in the British Colonies in 1834. On Bimini it’s a big deal and cause for great celebration. Next day, after a pancake breakfast at Captain Bobs across the street from the Sea Crest, we walked half a block north to view the remains of the Compleat Angler. The Compleat Angler, was undoubtedly the most famous of all structures on Bimini, and perhaps the most internationally famous structure in the Bahamas. This 12 room hotel on Kings Highway in Alice Town was home to Hemingway for three summers back in the ‘30’s. He wrote most of “To Have and To Have Not” on Bimini, when he was not busy fishing, playing ring-toss and drinking vodka martinis (reportedly his drink of choice while staying at the Compleat Angler). 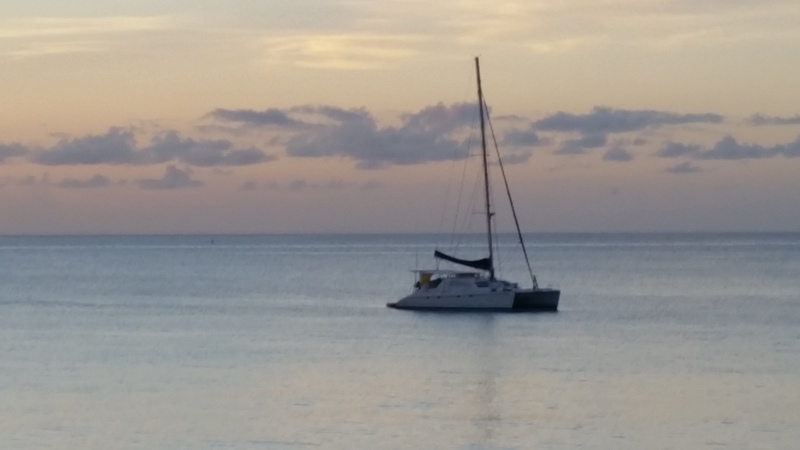 His Pulitzer Prize winning novella, “The Old Man and the Sea”, although written years later, was inspired by his days on Bimini. His posthumous novel, “Islands in the Stream” was Bimini inspired as well. Unfortunately, the Angler burned to the ground in January of 2006. The fire claimed the life of owner Julian Brown who died in the blaze after leading a guest to safety. 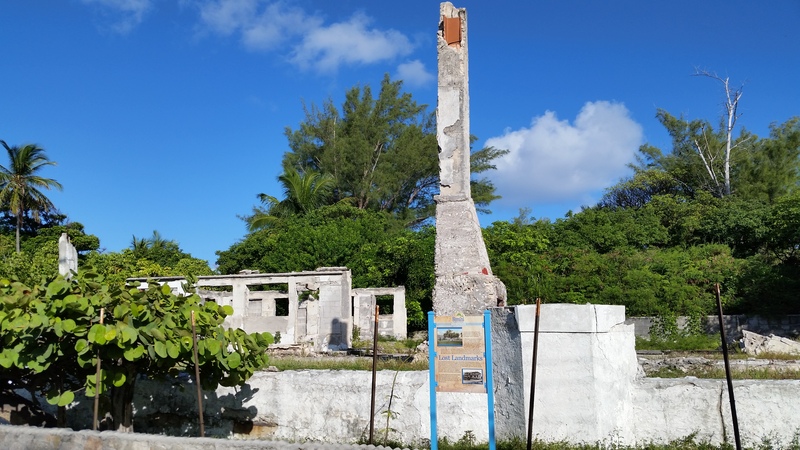 Today, the Compleat Angler is maintained by the Bahamian government as an historic site. All that remains of the Compleat Angler. To really see Bimini you’ll need a golf cart. Budget about $60.00 for a half-day. That’s plenty of time to see the island. We rented one at the hotel and headed up Kings Highway to see what was happening at the “North End”. Check your brakes before you head out in your golf cart. Our brakes were nearly non-existent. Fortunately, there aren’t many hills on Bimini, but there are a few, and you are on the road with full sized automobiles and trucks. Don’t forget to drive on the left. 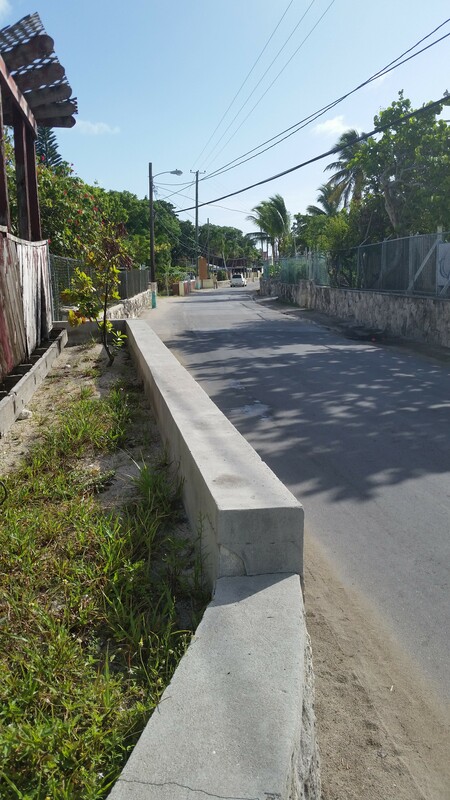 Accidents happen on Bimini and recently a foreign construction worker was killed driving a golf cart on Kings Highway. Drive carefully. At the North End, the cruise ship pier is complete and The Bimini SuperFast ferry from Miami now debarks passengers from the boat directly onto waiting shuttles. The trip from Miami to Bimini takes about 3 hours. There is, of course, gambling aboard. We carefully weave our way along the new roadways that connect the new hotel and gift shops. There is construction going on. Lots of it. This place is being built by overseas developers with very deep pockets. Eventually we chug up a small hill and round a bend. I stand on the non-existent brakes and we careen into a parking space in front of the casino. It’s about 11 AM and the casino is nearly empty, but it’s ice cold inside and it’s a welcome relief from the heat outside. Kings Highway, Alice Town, Bimini. It’s August 4th, my birthday. I’ve turned the same age as Hemingway when he died. In honor of Old Hem I drop a 20 into a slot machine. It gobbles it quickly and sits there waiting for more but I don’t give in. The bar is open so we order cold drinks. Briefly, I think a vodka martini might be an appropriate drink for the occasion, but remembering the brakeless golf cart waiting outside, I opt for a diet coke. We toast to my birthday, and Hemingway and Bimini and we leave. Traffic is light on the streets leading back to the highway, save for construction equipment. Condos are going up on Bimini. Big changes are coming here. Not all of them good. We spend the afternoon at a deserted beach and when we are done with the sun we head up to Sherry’s Bar at the edge of the sand. Sherry’s serves Kalik beer and fried lobster. That’s about all she serves but she serves it better than anyone, anywhere…that is a fact. It is the best fried lobster you’ll ever eat. Budget $20.00 per person for your fried lobster at Sherry’s — it’s worth every penny. As my wife said, “it is so good, you don’t want it to end”. Just don’t plan to go there on a Wednesday because Sherry’s is closed on Wednesday, along with a lot of other places on Bimini. My wife MJ at the world famous Sherry’s Beach Bar. That evening we decide to visit South Bimini, so we take the ferry back across the channel. 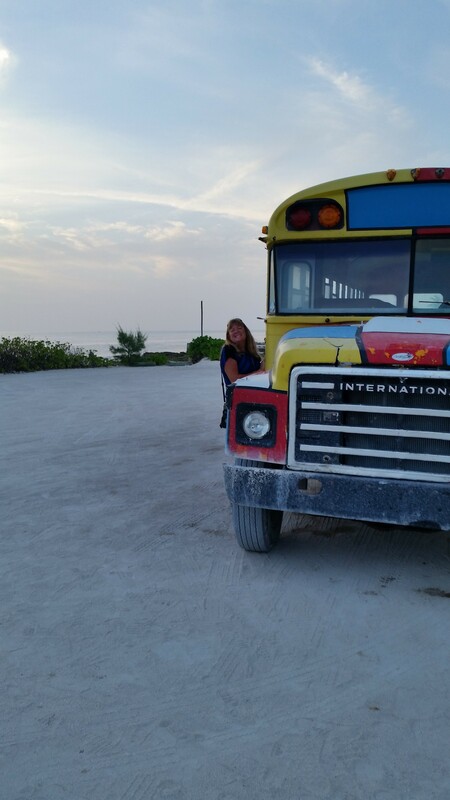 Transportation on South Bimini is very reasonable. Budget $00.00 for the free bus. It will take you directly to Mackey’s Sand Bar at the south end of the island. When you’re ready to leave, any of the restaurant staff will call the bus for you. The outdoor bar looks out on some of the most pristine waters in the Caribbean. Squint carefully and you can make out the shoreline of Gun Cay, ten miles to the south. By the time we left Mackey’s to return to the ferry, the place was packed. It was Wednesday, and unlike other Bimini establishments, Mackey’s is open for business. Wednesday is Karaoke night at Mackey’s, and half of Bimini turns out to participate. Plan your visit to Mackey’s accordingly, depending upon your like, or dislike, for singing games. On Thursday it was time to go home. The ferry picked us up at the marina for the return to the airport on South Bimini. Our flight was scheduled for 10 AM and when we saw the twin engine turboprop land we thought we were home free. Minutes later a gate agent came into the cramped waiting room to announce that the plane that was to take us back to Florida had blown a tire upon landing. He said that they would have to have a tire, and a mechanic to install it, flown out from Ft. Lauderdale. The wait time – a few hours. Again, leave your watch at home when you travel here. There are no amenities at BIM. Nothing. Not even a soft drink machine. Airport authorities suggested that in view of the long delay, we should go to the restaurant at nearby Sand’s Resort. Along with a dozen or so other stranded travelers we packed into a shuttle for the short ride over to the Sands. This plane is not going anywhere soon. You get to know people when you’re stranded with them, and we made a few new friends. One new friend is a firefighter from Chicago who comes to Bimini every year to fish. He was worried about his cooler of fish that had been loaded onto our crippled plane. He’d intended to be back in Chicago before the ice melted. Now things weren’t looking so good. I asked about the fishing and he said it was great, but the marina ran out of gas for the boats. Gas delivery to Bimini was delayed. We ate, drank coffee and talked for a while and when the waitress brought our check, I handed her my credit card. Minutes later she came back. “I’m sorry,” she said. “The credit card machines are not working today. Do you have cash?” I did, but barely. Bring cash when you travel to Bimini. Meanwhile, back at the airport, little was happening with our broken down plane. Soon after another delay was announced, a charter flight landed with new tires and a mechanic. We all watched him work, and when he was finished, he came into the terminal to great applause. “Thank you for saving us,” gushed one lady as if we’d been drowning in shark infested waters. By 4PM we were preparing to board our plane for the return 17 minute flight to the mainland. We were still waiting to board, when a Challenger 605 jet dropped out of the sky. 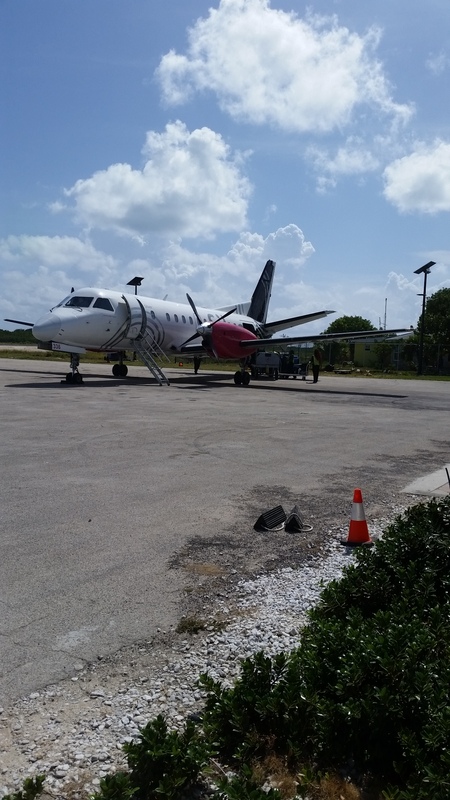 Not many jets land on Bimini. This is prop land. But this plane was different. It was the Casino plane, and it taxied up the terminal and deplaned 30 or so passengers onto the tarmac. High-rollers headed for the Casino. I watch them trudge toward the customs house, dragging their rolling luggage behind them, sweating profusely in the hot Bahamian sun. A new day is dawning on little Bimini. Enjoyed your piece on Bimini, sounds beautiful, but glad I got to see it thru your eyes and not have to go thru the ordeal of getting back and forth!!! Also loved your photos! Glad you enjoyed it. It is a pleasant flight really.